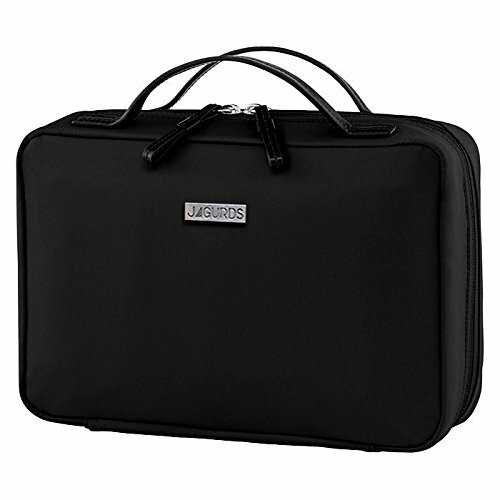 Anyone who travels a lot would appreciate this Jagurds Hanging Travel Toiletry Bag for Men, Women and Kids. I found it to be the ideal bag for my needs. The toiletry bag measures approximately 11 inches by 7.5 inches by 3 inches when closed, and opens into a full sized organizer that can easily be hung from any shower rod or towel hook. It features 4 water resistant zippered pockets, one of which is divided into two sections. The waterproof fabric lining keeps leaks and spills contained, so carrying your shampoos or lotions isn't a problem. The organizer is very attractive, and would be suitable for a man, woman or child to carry, and while large enough to carry all of your necessities is not overly large and bulky. The double zipper around the outer edge is perfect for opening this bag fully, and the clear material on the pockets makes it easy to see what is inside without having to dig through everything. I am very pleased with this toiletry bag and would recommend it to anyone who travels, or even as a makeup bag, or an overnight bag for the kids.